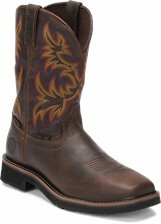 The 11-inch tall Driscoll Mahogany Steel Toe pull-on workboot is built for maximum performance. It's dark mahogany exterior is accented by a simple stitch pattern on the upper and features an Ortholite® insole for lasting comfort and a steel shank for added support. Its Vibram® Commander-X5™ rubber outsole is resistant to heat, oil, chipping, chemicals, and slipping and provides stability on various terrain and a steel toe provides protection while you're getting the job done. 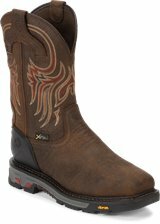 This boot is electrical hazard rated and meets ASTM F2413-11, 175, C75 EH safety footwear standards. I've had these boots for approximately 2 months now. Saturday I had a terrible time getting my foot out of one of the boots. Felt like the liner was slipping out with my foot. Today it took me a half hour to get my foot out. Had to cut away at the liner and back of the boot just to free my foot. Have never had this problem from any other boot I've worn. Now the boot is ruined and I'm out $200. Would've given 0 stars but can't go that low. I've been working in the oilfield for 12 yrs as a supervisor. I do very little actual physical labor but I'm required to wear safety toe boots. I picked these because of the Vibram sole for comfort. After less than 4 months of use (really only 2 because of the shift I work) these soles are falling apart and the inner liner is coming loose making it very difficult to pull them off of my feet. Do not waste your money on these and fall for the Vibram sole comfort gimmick, it is not worth it. 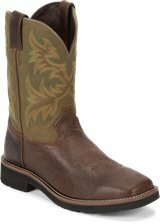 Before I bought this boot I had never bought slip on boots or square toe, I always bought lace up and round toe, so when I was shopping for new boots the salesman showed me these, but, I wasn’t interested, so after trying on all the lace up and round toe boots he had in stock, I was on my way out of that store, as I was passing the display for this boot the salesman asked me one last time if I would like to try this boot on, so just to entertain him I said “ok why not”. And as soon as I put them on and stood up and walked I fell in love with these boots, they are the most comfortable boots I’ve ever worn and I am so glad I finally decided to try them on, that was 5 months ago and these boots have been great, I will not buy any other work boot from here on out. I tell everyone how much I love these boots. Most comfortable boot i have ever wore! I have a wider foot so i can wear anything but square toe boots and have always ha trouble finding ones that fit well that steel toes. Then I tired this boot on, from day one it was the most comfortable boot i have ever wore, and i been wearing boots for 25 years. 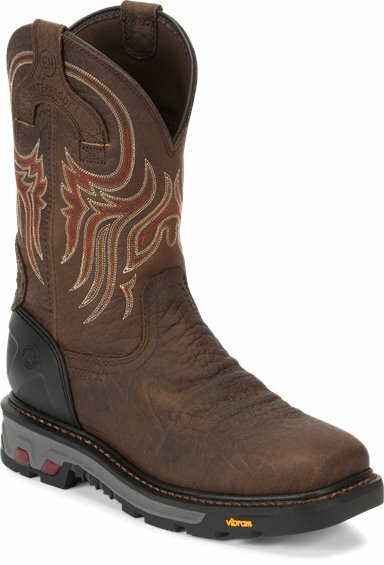 This is the only boot i will ever buy. Bought this boot 9 months ago and the insole failed coming loose along with the lining, everything inside is tearing up and i can no longer wear them.